1. 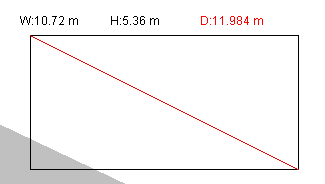 Before motion is started, you may drag the red object to alter its position or the red points at the top and the bottom of the incline to modify the track. 2. After motion is started, you may view the "forces acting on the object" or " velocity, acceleration vectors" by clicking anywhere alternately. 3. 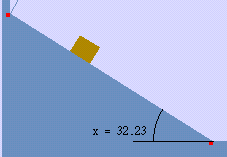 A rectangle with stated dimensions is dragged out from a point when the "Control" key is pressed . This rectangle is used for length measurement. 4. The mass of the object is 1 kg. It rebounds elastically at the ends of the track. The potential energy is zero on the ground level. 5. The static coefficient of friction and the kinetic coefficient of friction of all surfaces are assumed to be the same.